Long established suppliers of many grades and sizes of wire cloth. Manufactures zinc plated iron wire, stainless steel wire mesh, brass wire mesh, hexagon mesh, welded wire mesh, galvanized square-hole mesh, window screen. Professional manufacturer of stainless steel wire mesh, nickel wire mesh, brass wire mesh, also welded wire mesh, hexagonal wire netting and wires. Manufacturer of wire, wire mesh and its processed filter elements, mainly stainless steel wire mesh, nickel wire and wire mesh, also expanded metal mesh for battery. Manufacturer of metal, nonmetal wire mesh and wire mesh machine. Mainly barbecue grills netting, stainless steel wire mesh 2 mesh to 400 mesh, cloth 24meshx110mesh to 200meshx1800mesh. Offers fencing series wire mesh products and filtration wire cloth, including stainless steel and wire mesh, brass wire mesh , barbed wire, fence netting and related items. Manufacturer of woven wire mesh in stainless steel and brass, welded wire mesh,barbed wire and wire mesh machine. Manufactures barbecue grill wire mesh, crimped wire mesh pieces, welded wire mesh and hexagonal wire netting. Manufacturer of welded wire mesh series wire netting against mosquito, welded wire mesh, hexagonal wire netting, stainless steel wire mesh, brass wire mesh. Manufacturer of wire mesh discs and baskets, wire strainers and containers, also welded wire mesh and other wire mesh products. Manufacturer of wire mesh disc filters and sieves made from stainless steel wire mesh, brass wire mesh and other metals wire mesh. stainless steel wire mesh,dutch wire cloth,welded mesh,other wire and wire mesh products. Manufacturer of stainless steel woven wire mesh and wire cloth,black wire cloth,other wire mesh products and processed wire mesh filter discs. Aluminum alloy wire mesh for insect screening, crimped wire mesh,magnese steel mine screen mesh,stainless steel wire mesh and others. Manufacturer of stainless steel wire mesh and wire cloth, aluminum expanded metal mesh, nickel wire mesh and disc screen, etc. Manufacturer of woven wire mesh in stainless steel, iron and brass, welded wire mesh and galvanized iron wire. Also supply wire mesh machine. Manufacturer of black wire mesh fireplace replacement screen, wire mesh for bed and wire mesh shoe scraper mat. Manufacturer of wire mesh products, mainly Stainless Steel Woven Wire Mesh, Brass Woven Wire Mesh, Square Woven Wire Mesh, etc. manufacturer of welded wire mesh, galvanized hexagonal wire mesh, expanded metal and wire mesh fences. Manufacturer of stainless steel wire mesh, brass wire mesh, welded wire mesh and other types. Manufacturer of galvanized iron wire, welded wire mesh, stainless steel wire mesh and other wire products. Woven wire mesh and welded mesh for filters, sieves, screens, also galvanized steel wire, PVC coated iron wire and tie wire. Manufacturer and exporter in China. Manufacturer of stainless steel wire, soft iron wire, galvanized wire, series of metal woven mesh products including stainless steel wire cloth, brass mesh, hexagonal mesh. Manufacturer of welded wire mesh, galvanized square wire mesh, hexagonal wire netting, stainless steel wire and mesh and various steel wire netting. Manufacturer of chain link fence and other wire mesh fencing series products, also wire mesh and wire mesh processed products. Manufacturer of stainless steel wire mesh, welded wire mesh, stainless steel insect screen,dutch woven wire cloth,nylon wire mesh, ect. Manufacturer of stainless steel wire mesh and cloth, other metal wire and wire mesh products. Manufacturer of metal wire mesh products including galvanized wire mesh, stainless steel wire mesh and galvanized iron wire. Manufacturer of stainless steel wire, brass wire, galvanized iron wire, black annealled wire, cut wire and a variety of wire mesh products. Manufactures wire mesh products, mainly welded wire mesh, PVC coated iron wire and PVC coated wire mesh, other wire and screen products. Manufacturer of hexagonal wire netting and welded wire mesh,also other wire,wire mesh,wire netting products. Manufacturer of hardware cloth series wire mesh, galvanized square wire mesh, fencing series wire mesh, galvanized steel wire and spring steel wire. Manufacturer of stainless steel wire mesh, brass wire mesh, galvanized iron wire, PVC coated wire, iron nail and more. If the business hours of Robinson Wire Cloth in may vary on holidays like Valentine’s Day, Washington’s Birthday, St. Patrick’s Day, Easter, Easter eve and Mother’s day. We display standard opening hours and price ranges in our profile site. 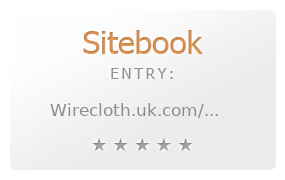 We recommend to check out wirecloth.uk.com/ for further information. You can also search for Alternatives for wirecloth.uk.com/ on our Review Site Sitebook.org All trademarks are the property of their respective owners. If we should delete this entry, please send us a short E-Mail.